The greatest gift is a wealth of beautiful lakes and the natural surrounding of the Barnim. Water sports and cycling are the most popular holiday activities here along with swimming, surfing, scuba diving and water skiing. The water sport tourism initiative project of North Brandenburg (WIN), the Barnim region and the town of Eberswalde are working together to create an ever better environment for water sport activities. One of the largest and most well known is the Werbellin Lake. Theodor Fontane named it as a »a fairytale place « during his travels through the Mark Brandenburg. The lake can be walked around close to its banks and in the summer months there is a tourist bus service for this beautiful district. Also holiday cyclists use this bus service. Tourists and day trippers have the idyllic Finow Canal to themselves. The oldest man made canal in Germany is used almost exclusively for tourism. One of the main attractions in the Barnim is the gigantic 70 year old ships lifting facility at Niederfinow. Riding, ballooning flights, boating, tennis and golf – there is almost every holiday activity you could wish for in Barnim. There are ideal conditions for cycling holidays: Barnim has put together a great choice of routes with information on differing themes that vary in length and degrees of difficulty. One holiday will not be enough to see them all! 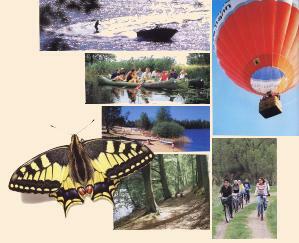 For walks and cycle tours the wide open countryside (a National reserve) and the Barnim nature parks are great attractions. They help to guarantee the survival of many endangered species. The Schorfheide with its heavenly lakes, rivers, moors and heaths is the largest single forest in Germany. It is part of the UNESCO “Schorfheide-Chorin Biosphere Reserve”. The people of Barnim are literally surrounded by the beauty of nature. Idyllic churches built from glacial boulders attest to a long history in the Barnim parishes, impressive places of worship in the North German red brick Gothic style. Today there are concerts in the Cistercian monk cloisters of Chorin and festivals of old music in Bernau’s St. Mary's church. For those who seek the flair of the town, they will be well catered for in Eberswalde and Bernau near Berlin. Because of its proximity to Berlin, Bernau has been named »the gate to Barnim«, it shines with historical buildings and has a town wall 1 ½ kilometres long and is home to the Herz-Jesu-Kirche (Heart of Jesus Church). The 750 years old town of Eberswalde is known for »the best little zoo in Germany« and on the aerial of the Country garden show in 2002, there is the family garden with its massive industrial monuments and a unique fairytale landscape for the children to play in. Typical for Barnim, it is situated close to the water on the banks of the Finow canal.